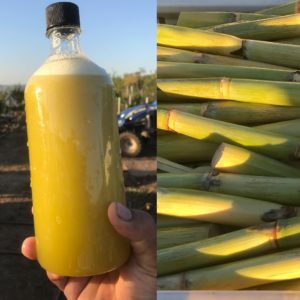 The following profile is based on a conversation between Isabella La Rocca and Andy Ninh, founder of Calidragon Veganic Farm in Riverside, California. I was born in North Vietnam. I was about 8 when China and Vietnam stopped fighting and they kicked all the Chinese Vietnamese back to China. My family lost everything and we just ended up at the train station. They put us on the train and we went back. We moved — I’ve been moving all my life — from relative to relative, and finally we escaped China on a boat. We were boat people. We landed in the refugee camp of Macau and then we went to Hong Kong. From there, a Christian or Catholic family in Dallas sponsored us to come to the United States, so we first landed in Dallas. They were on vacation so we never got to see them. It was so damn hot in the summer. We landed in the oven! My grandma was in California, so we requested to come here and that’s how we started. I used to get haircuts from my friend’s uncle. He loves to grow things in his garden and I’ve always envied people who have a garden because we always lived in apartments. I never had dirt! For a long time he grew dragon fruit that he imported from Vietnam and he said it’s really easy to grow. The price was good too, 7- 8 years ago you could get 7 to 9 dollars for a pound. He said, ‘I’ll teach you how and I’ll give you the cuttings and everything.’ I thought, “Hey, this is a great opportunity to get into farming”. I convinced some friends to get into it with me; one of them had just bought some land, we provided the labor, and that’s how we got started. 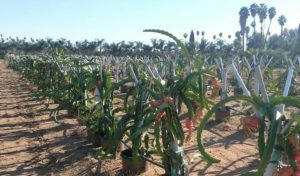 Later I bought my own piece of land and spent a year preparing it while propagating dragon fruit in a partner’s backyard. Did you farm organically from the beginning? Yes, because I didn’t know anything about chemical farming. And it was very close to veganic because I didn’t know much about organic either! I tried to compost and at the beginning we bought some organic compost and a truckload of raw chicken manure because it’s cheaper than buying it ready made. It sat on the farm and it just smelled, for a long time. When I tried to use it, it actually killed off a lot of my dragon fruit because it was still raw. I learned everything through trial and error. When did you transition to veganic? We started in 2007 and got our organic certification in 2008. I did that for five years and really focused on learning how grow the stuff, not marketing it. During that time I went vegan, so when we moved to our current location, I started to farm veganically. Veganism saved my mom’s life. She had colon cancer and she was going to have a surgery, but I told her about veganism and why meat is bad. She cut down on meat and her cancer just went away. She never went back to the doctor, so we don’t really know, but she feels fine. I think so, because for me compassion is more important than health. I tell everybody, ‘I’m doing all this for humans, to teach them to go vegan. The ultimate goal is for the animals.’ It’s redemption. There’s not much we can do to pay back what we did to them all these generations, but it’s good to start now. I see this farm as part of that. We purchased the farm in March 2014 and moved here in July 2014. For a long time, I debated about going veganic because on my old farm I had chicken manure. It breaks down after a few years and makes very good compost. I asked myself, ‘Do I really want to go vegan? !’ That was a test. So I left everything behind and just moved here with nothing. It turned out that I have access to free cow manure right there from the dairy farm across the road. Everything was testing me! It would have been easy to continue farming organically, but I thought, “No, I just have to do it.” Once you open up your compassion, you see all the suffering. So I looked for veganic compost and I tried it out. Last year, we had an amazing harvest of dragon fruit. Before, when I grew organically, the fruit was sweet maybe only about 50-60 percent of the time. Occasionally you’d get a very sweet fruit. But last year, I would say 98 percent of the fruit was super sweet. 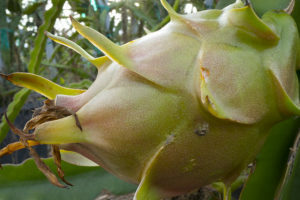 The name of the farm comes from California dragon fruit. At the moment, sugarcane, dragon fruit, and I’m trying out heirloom tomatoes and eggplant. I’m going to start growing common crops like tomato and kale so I can market to restaurants. My ultimate goal is to farm tropical fruit because I want to become a fruitarian. I think raw vegan or fruitarian is the best diet. Nothing is packaged or cooked. 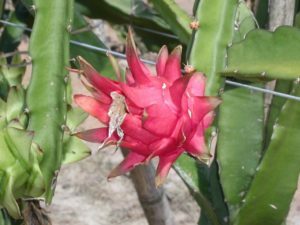 It’s so sustainable and also the most nutritionally dense, so I’ll continue to develop dragon fruit as well as all sorts of tropical fruits. I have a variety of fruit trees now. When they develop fruit, I’ll try a fruitarian diet and teach people the same thing. Yes, Garden of Eden in Washington. * I heard about them soon after I became a veganic grower and I learned about their woodchip growing method. It saves so much water. We went up to visit and we got to try his fruits. It’s amazing. I gained a lot of insight from him. For example, I learned about insects – they are not actually bad for the plants. The reason insects attack a plant is if the plant is unhealthy, so they are actually identifying a sick plant for us. You don’t want to eat that anyway because something is wrong with the way you’re growing. Not enough water, or too much heat, or whatever. If they eat up your crop, that’s fine! You’re going to get a better crop the next time around. We don’t understand that — we kill them and poison the plant instead. He mostly uses veganic methods. I think he might use some chicken manure from the chickens he raises. I don’t think manure is bad for farming, don’t get me wrong, the problem is where it’s sourced. If it’s from an animal sanctuary, use it! From a stock farm, then no. Don’t support them. What are your thoughts on the sustainability of veganic methods? I think veganic is the most sustainable way of farming because you have to emulate nature to the fullest. Just by being here by myself all these years I’ve learned so much about nature and I am slowly trying to create a veganic permaculture design integrating woodchips. I’ve learned a lot from rabbits, for example. When I grow eggplants, at first they come to eat up the whole plant and I’m left with nothing. But they never dig up the roots, so it gives the plant time to build up the root system. You get an abundance of eggplant after that because the roots had a chance to develop. Now, you can see my eggplants coming up very strongly. Then you realize that nature doesn’t really uproot anything. Grazing animals only eat the top of plants; they just prune them. Only humans dig everything up and cut everything down, but nature is about a good animal and plant relationship. You prune them, they get stronger, and they give you more. That’s how it should be, and that’s why I have a lot of confidence in veganic farming. With small-scale farming, you can change your climate very easily. I have a neighbor who has a private golf course. It’s very nice in there because he grows trees all around. He created a microclimate where the temperature and everything else is different. We can easily do the same with shade structures. Most vegetable crops want some shade. If you provide shade structures, you’ll save a lot of water and your fruits will be a lot better. There are so many techniques for water and land conservation that you can bring to almost any climate. I mean, humans can grow food in the snow and in the desert, right? Really, location is not an issue anymore. We have the technology to do all that. How do you think we can spread veganic agriculture? I think education is what matters. I’ve come to realize that I can’t grow food for everybody… our society is structured so that we depend on each other for certain things. When it comes to food, people need to take that responsibility back onto themselves. If 10 guys, or 100 guys, depend on one guy to grow their food, it’s going to put a lot of strain on that guy. Nothing good will come of it when that guy is stressed. That’s the situation we’re in. The majority of the population depends on 1 or 2 percent to grow the food, so of course they have to do whatever they can. I think we can and should grow a lot of our own food. Rice, potatoes, commodity crops: maybe for those we can rely on the big guy. Just make sure they do it right. But with fruits and vegetables, we should grow our own if we can. It’s cheaper and more rewarding. That’s how I would like to see veganic spread, but of course it will probably take a long time. Not everybody wants to do that, but we can start with the kids. The future is in educating the kids – I’d rather prioritize educating and exposing them to this. At this farm, I’m trying to make myself sustainable and once I do that, I can teach people to emulate what I do. 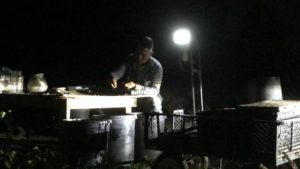 At that point, I would love to get involved in projects that help the homeless by helping them get land, put up container homes and solar panels, and teach them to live off the grid, to grow their own food and to market it. That’s my dream, I think it’s the best way to solve the world’s problems. No more homelessness and everybody eats veganic. How can the vegan and animal rights community support you? It’s good to have the community help me but what I’m struggling with is that it discounts the genuine message I want to bring out. Like, ‘Hey, I’m teaching you to eat vegan so you can buy my produce.’ I don’t want to be in that position so I’d rather teach you to grow your own food. We shouldn’t be dependant on the vegan community. Everybody needs food, not only vegans, so we should be able to market veganic food through regular channels. I’d like to do CSAs but I don’t have the manpower. I’ve spoken with a few vegan restaurants that are excited about our produce and I’ve recently started selling at farmer’s markets. I know I will make a good living off of this eventually, so it’s not a big concern. It’s a struggle right now because I put so much time into it, but eventually it will work out. My dream is to bring out the message, to increase awareness. I think it would be good to share all that I’ve learned about nature. I’d like to turn a portion of my land into an educational center and bring school tours, give lectures, maybe host health retreats. I also have containers that I’m going to convert into container homes. I’d love to get involved in agritourism and educational projects. There’s a lot! I think all vegans dream about sharing the vegan message: it’s all about reversing ignorance. I used to blame other people, the animal industry. It’s not even about that. It’s about a tradition of ignorance. Now, we try to build a tradition of compassion and wisdom. That’s what veganism is all about. It’s not only a diet, it’s a new way of life for humanity. The problems that we’re facing right now come from the fact that humanity, throughout history, has been trying to please themselves. We try to make everything comfortable for ourselves and forget about anything else. But now I’ve come to realize: that’s the problem. That’s what Buddha and all the religions talk about. Don’t please yourself. Please God. Every day what you do, every thought you have, every word you say… think, talk and take action to please God, not yourself, and all your problems will go away. And when you say God — what is your understanding of God? To me, Buddha, God, whatever you want to call it, is the universal soul or consciousness. We’re all part of it. The more you let go of your ego, the more you’re connected to it. It’s not a male, female or anything like that. I use God and Buddha, or the universe, interchangeably. It’s more important to be spiritual than religious. You don’t have to identify. I’m open, now. It’s about the greater good that we all belong to, that we are part of and is part of us. Just like in a relationship or friendship. Your friendship or relationship is better if you just try to please each other and not expect the other one to please you. Same thing, I think. 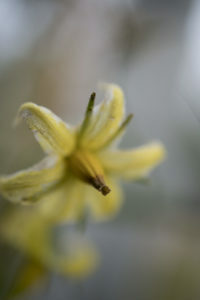 * “Back to Eden” is a full-length documentary about Paul Gautschi’s farm, viewable for free at www.backtoedenfilm.com.